Anelok is a personal password safe that stores your accounts and passwords, and lets you retrieve and use them in various ways. Anelok stores account information on a removable memory card. This information is encrypted with a key securely stored in the MCU. An overview of the security architecture can be found here. Account information can be looked up by manual browsing or it can be requested over USB or radio. 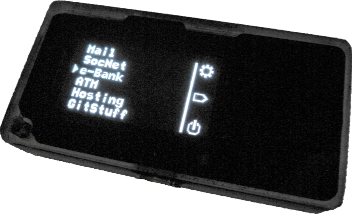 Passwords can be displayed on Anelok's OLED display, Anelok can act as a keyboard and "type" them to a PC or smartphone, or one can also implement encrypted protocols on top of USB or radio. Curious ? Try the simulator. Note: Some information on this page refers to the "Mk 2" design with a CR2032 battery and a single MCU. The upcoming "Mk 3" design has a AAA battery and two MCUs.